Don’t be fooled when Chief Executive CY Leung announced that the deadline for implementation of National Education in three years’ time will be withdrawn. It is certainly a back down after history was made on 7 Sept when 120,000 people wearing black blocked the area in admiralty and Wanchai in strong protest against brain-washing National Education. But this announcement by CY Leung is not meeting their demand for withdrawing National Education. In effect, CY Leung said it is an amendment of the policy on National Education, implying that the Govt is not abolishing the policy. It is just that the decision is now with the schools as to whether National Education should become an independent subject, or how should it be taught. But the devil is in the details. The Government will still issue guidelines on National Education, and when an individual school is to implement brain washing national education, it leaves to the lone force of parents to fight against it. 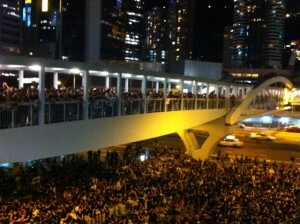 Leung even went to the great length to remind HK people not to disturb those schools that will run National Education. What would this lead to then? The children from privileged families will continue to be given quality education without the rubbish and brain-washing national education, while the poor will continue to be admitted to schools that are not top notch, and offer education of sub standard and therefore would consider national education rather than citizenship education more important. It would aggravate the learning and academic achievement gap between the poor and rich. I want to add that Leung said a few days ago that there is much room between withdrawing and not withdrawing National Education, in a typical way of maneuvering language to be vague and cover the truth. The most recent announcement is yet another example of him being vague and playing trick on words. Anyway, truth and candidness can never be associated with him. HK Government under Leung’s leadership is hopeless. But, this is what it should be like right? After all, Leung was elected by 600 plus people only, backed up by Beijing. While despising Leung and his government, I am so proud of hk people who have decided to rise up and revolt, especially those high schools students who are the driving force behind this city-wide campaign against brain-washing National Education, those on hunger strike, and many many HK people who marched and rallied, culminating in the amazing big rally on 7 Sept. I am so proud that i am one of the people in the protest. it feels really good to do something for someone else, not myself. i hope the government doesn’t withdraw the policy of national education. If I could hold two passports I think I would apply for the HK passport now, very proud of HK protesters!And you’re absolutely right. The devil is in the details. I’m afraid this now the implementation will just creep into a lot of schools without the public noticing it. When I was working at a local kindergarten a few years ago, they were already singing the Chinese National Anthem and noone seemed to find that strange. I want to congratulate Hong Kong people! It’s amazing how they fight for their rights. I wish myself and my fellow Mexicans were able to do the same against our (even more) corrupt government. 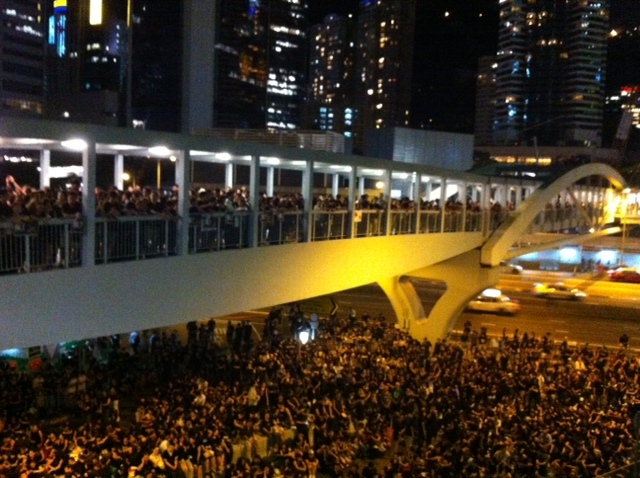 Kudos for Hong Kong People! Stand for your rights!